At Hemness Law, we limit ourselves to the practice of Elder Law. Elder Law is a unique area of legal practice which is defined by the type of clients we serve the elderly and persons with disabilities. Elder Law is a complex area of law combining the different elements of estate planning with health care planning. Estate planning often involves the preparation of legal instruments such as Wills, Trusts, Durable Powers of Attorney and Advance Directives. Upon demise, estate administrations such as Probate or Trust administrations may be necessary to transfer assets from one generation to the next. Health care planning deals with the challenges confronted by older adults with the primary objective of getting quality care and paying for such care without total and complete financial impoverishment. Within Elder Law, opportunities for asset protection while qualifying for programs of government assistance such as Medicaid, Medicare, Social Security, and Veterans Benefits, are thoroughly analyzed. In addition, incapacity brought on by disease or the natural processes of aging often requires Guardianship which is a major practice area within Elder Law. Many of the same laws affecting older adults are of special relevance to persons with disabilities, whether they are children, young adults or seniors. Advising families about the intricacies of SSI and Medicaid programs for persons with disabilities is a key area of practice in Elder Law. Families with special needs members are also counseled on appropriate legal documents and processes, such as Special Needs Trusts and Guardian Advocacy, respectively. Molly became a staff member of the firm in February of 2015. She is the firm Office Manager and handles administrative tasks and bookkeeping. Molly was born and raised in the Tampa Bay area, Florida and has lived here her entire life. During football season, you can find her cheering on the Gators and the Green Bay Packers. In her spare time she enjoys spending time with her friends and family and going to Disney. Don has served as the Records Custodian for the firm for nearly a decade, supervising organizational storage of all client materials and documentation, facilitating the firm's implementation of an eco-friendly paperless storage format, and personally overseeing assimilation of all client legal documents. Other than Emma, Don is the longest serving employee of the Law Office of Emma Hemness PA.
Jessica joined the firm in November of 2015. Although new to the legal field, she has over ten years of experience as an officer and administrative assistant and over nineteen years of experience as an investor in various private business consulting companies. At the firm, she assists with Guardian Advocacy and Guardianships matters. Jessica received her Bachelors of Science degree in Business Management from the University of South Florida Tampa campus in late 2008. Born in Rockford, Illinois but mainly raised in Valrico, Jessica currently resides in Riverview with her husband, Vaughn, a technology teacher at St. Paul Catholic School in Saint Petersburg and their beautiful new addition, daughter Nagisa. Jessica is a proud member of the G.F.W.C. Valrico Service League, which is part of an international women’s organization with a goal of improving the community through volunteer service and also volunteers help at her husband’s school. In her spare time, she enjoys hanging with her family and friends and exploring theme parks. Brittany became a staff member of the firm in March of 2017. Although new to the legal field, she has over ten years of customer service experience. At the firm, she is assists with Medicaid and Long-Term Care matters. Brittany received her Associate of Arts in Liberal Arts in 2011 from State College of Florida. In May of 2015, she received her Bachelors of Arts degree in Criminology from the University of South Florida. Brittany was born in St. Petersburg and has lived in Florida her entire life. In her spare time, she enjoys hanging out with her family and friends, and going to the movies. Carla became a staff member of the firm April 1, 2017. Although new to the legal field, Carla has over five years of experience with as an administrative assistant and six years of customer service experience. At the firm, Carla assists with Estate Planning and Long-Term Care matters. Carla graduated from Hillsborough Community College with her AA in Liberal Arts in May of 2014 and her AS in Paralegal Studies in December of 2016. Carla was born in Tampa, Florida and has lived in Florida her entire life. During her free time, Carla enjoys watching the Tampa Bay Lightning, Florida State Seminoles, and New England Patriots. She also enjoys spending time with her friends and family, reading, and playing with her six dogs. Erika rejoined the firm in March of 2018, having previously been a member of our team from May of 2014 to August 2015. Although Erika was new to the legal field in 2014, she has since gained experience as a legal assistant in Georgia where she handled matters involving Estate Planning, Long Term Care Planning, Probate and Guardianship. At the firm, she assists with Probate matters. 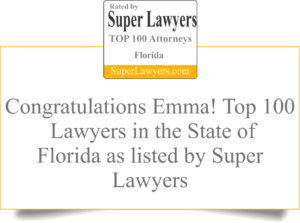 Prior to joining the legal field Erika worked extensively in the customer service industry and received her Bachelors of Arts and Science in Psychology from the University of South Florida. Born and raised in Tampa, Florida, Erika has recently moved back to the area from Atlanta, Georgia. She now lives in Valrico, Florida with her husband, Wayne, and their dog, Gronk. In their free time, they enjoy taking Gronk to the dog park, cheering for the New England Patriots and spending time with friends and family.